The most compelling feature of this sweeping variety of short stories, some memoir, some fiction, by author Mitch Rapoport, is that each paint infinitely detailed pictures that breathe life into them. The Molly Chair saga spans over 100 years and follows the path of Solomon’s finely hand-crafted gift for his wife, as it travels down through the generations, and carries with it a trail of triumphs, loss, and memories. Another tale is of the widow, Estelle, whose lifetime is indelibly tainted by a thread of shocking and catastrophic tragedies for the men who share her life. There is the touching story of a man whose profound, but unrequited love, is for a woman above his station, and from it, he provides the world with an astonishing spectacle. The story of Mortimer Barnes, an ineffectual and modest man, will fill you with foreboding when a nightmare turns into a gruesome and bizarre end. You’ll meet Celeste, whose unrepentant miserly existence alienates the world around her. You’ll recognize the contemporary irony in the amusing tale of a man who finds humor in the appalling side effects of drugs advertised on television. You might recognize yourself in the coming-of-age true sagas of a 13-year old’s first experience with physical love and the hilarious account of 2 mischievous young boys who nearly drive their gentle grandfather mad! You’ll read an entire story that takes place within a span of 5 minutes when a gun is placed to a man’s head, and the strange tale of a person who discovers a curious mystery surrounding his late mother’s internment. There are 14 stories in all and each has a twist or surprise ending that is often the hallmark of Mitch’s writing. Be prepared to laugh, think, cry, and shiver! It's chocolate for your brain! Celeste loosened her legs from the permanent indentations in the saggy couch cushion, swung them over the edge, and stuffed her pale feet into the pink furry slippers she had worn around the apartment for years. From the start, the dollar-store slippers had been just a smidge too small for her feet, and her heels hung out over the backs. ‘But,’ she said to herself; ‘a bargain is a bargain.’ In self-defense, her heels had long since ensconced themselves in a thick gray layer of protective callus. She stood, pulled her dingy housecoat tightly around her, glanced at the clock and shuffled toward the door. It was almost lunchtime. In a few moments the familiar engaging strains of the Days of Our Lives theme music would begin. The doorbell’s jarring croak rang out a second time. “I’m coming… wait… I’m coming!” she wondered who could possibly be at her door. The bell rang so rarely these days that the abrupt rude buzzing electrified the stale air of the fourth-story walk-up. The noise had jangled her nerves momentarily. She lowered the volume as she passed the TV set. Mortimer’s sat upright in his bed and the blankets fell away. His arm hairs stood upright on tiny bumps. He was damp and trembling. Small droplets of sweat dripped into his eyes. He wiped them away in the hope of wiping away, along with them, the tiny flashes of shadow that seemed to jar him. The vivid nightmare was quickly fading in his mind and, try as he would, he could summon no exact memory, just fearsome glimpses of the terrifying vision he had experienced. All he could remember was the dreaded feeling of endlessly falling, plunging into utter blackness. “He’s cool. We done this plenny-a tahmes ta other guys. Sure was scayerd. Man!” Ricky pronounced this wisdom with a crack of pride. “First Jew I done it ta. Man! He’s cool though.” He hit me on the back like we were old pals. I wished I was home instead of this crummy diner at two AM in Lake Worth, Florida, with friends that felt more like strangers each passing day. I could never forgive them for what they had done to me. OK, I have to admit that I didn’t write any of these stories. They just seemed to pour out of me, perhaps as an accumulation of many years of a strange life mixed with overabundant amounts of chicken soup and matzo balls. My close friends convinced me to put some them into book form, so here they are. As a voice actor and spoken word performer, I have performed everything from real estate videos, radio ads and television commercials, to the award-winning portrayal of Abraham Lincoln’s Gettysburg Address for Adam Gault Animation Studios (Google: Mitch Rapoport Gettysburg Address). As a writer, my work has been published in business journals and I have crafted technical papers, advertising copy and video scripts. I have published magazines and newspapers. In support of my writing and speaking career, I’ve held many conventional positions: engineer, designer, restaurateur, real estate Broker, chef, inventor, teacher, business consultant, you name it. But, all those aside, I guess I’m known most for my off-beat sense of humor and storytelling abilities. 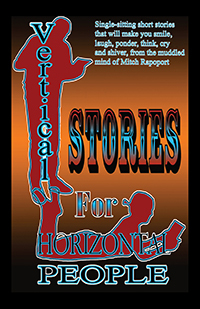 Vertical Stories for Horizontal People is a collection of my short stories, in the hope of making you smile, laugh, think, ponder, cry – or shiver in your soul. Some of these stories are true and some are fabrications. Except for my family, I have changed the names of the people involved (none of them were innocent, anyway). Having spent my life with what we now refer to as ADD (Attention Deficit Disorder), I lean toward stories short enough to read in a single sitting. The true stories in this book were colored by that condition. When I was young we were called underachievers and bad kids. Today, I believe that what we have labeled Attention Deficit Disorder is a complete misnomer. It is neither a deficit nor a disorder, but society’s attempt to fit a square peg into a round hole. I am definitely a square peg!